Add the bacon and fat to a cold pan, then place on the heat. Keep the heat on medium-low for about 5 minutes to let the fat and juice out of the bacon. Once the bacon’s crispy, crank the heat up to full, add the tomatoes and stir continuously. When tomatoes and bacon are looking brown on the edges, throw the cheese balls and basil in, toss for about 10 seconds and serve immediately. NB: If you eat this immediately, you’ll get the sensation of a ball of cheese actually melting in your mouth. If you’re fresh out of bocconcini, any cheese will do. 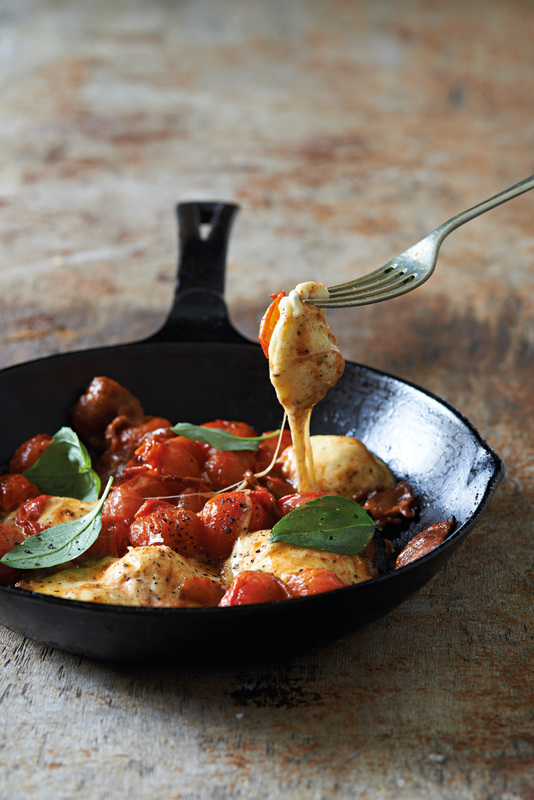 Brie and Camembert are superb with tomatoes and melt brilliantly. 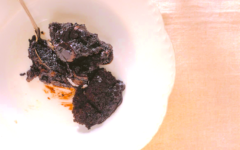 From The Real Meal Revolution by Tim Noakes and others. 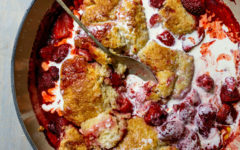 CAN YOU RESIST THIS DREAMY STRAWBERRY COBBLER? 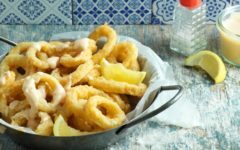 CALAMARI RINGS THE PORTUGUESE WAY!